The secluded setting of the Alan Pye Cottage. 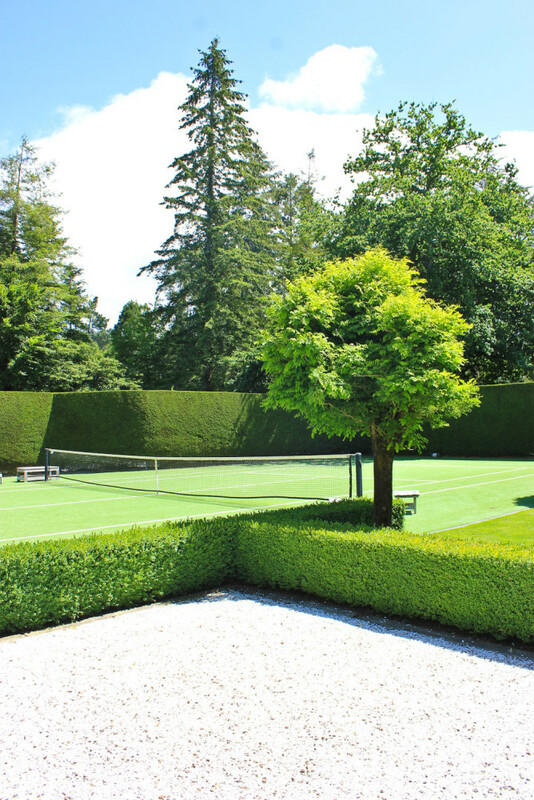 The manicured gardens bordering the Alan Pye Cottage. How English! Fine gardens border the tennis court. Tree ferns adorn the swimming pool. 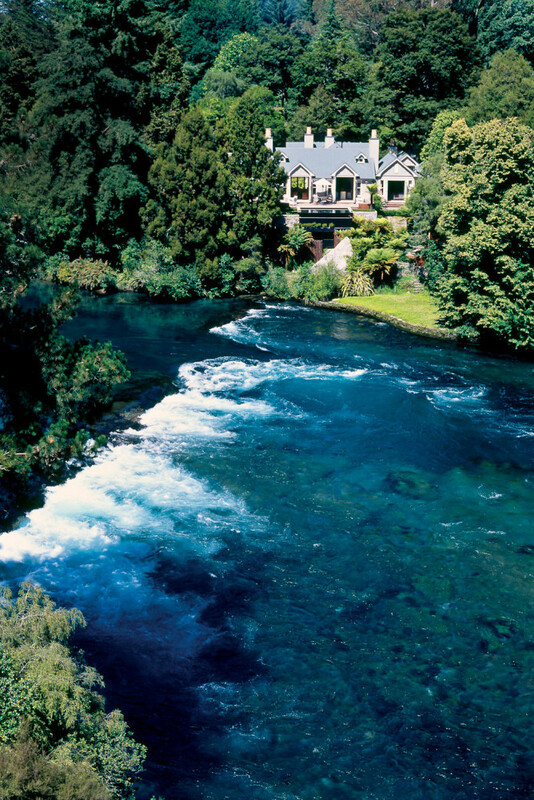 The clear blue waters of the Waikato River frame Huka Lodge. 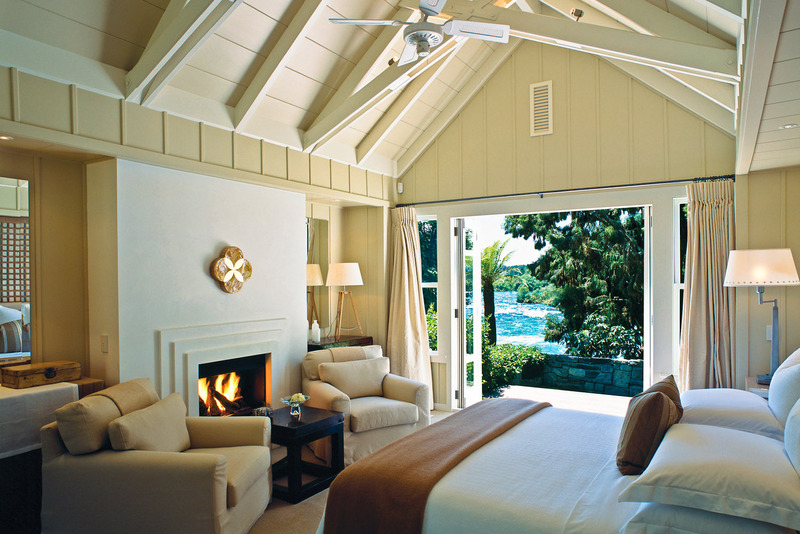 Remarkable views from the Owner’s Cottage. Guest suites are spacious, light and airy. 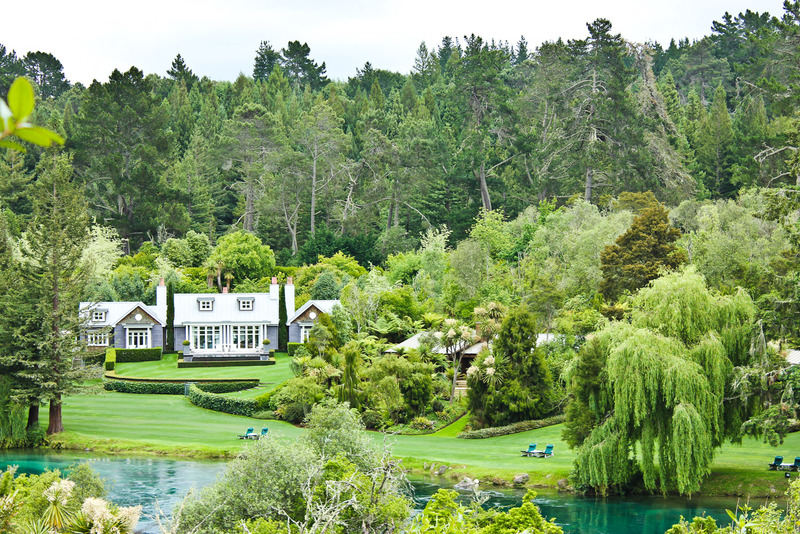 Taking up a position in a setting of unprecedented beauty on the Waikato River, Huka Lodge has a sense of luxury so refined that it makes royals feel at home. By Lara Picone. Regrettably, my own holiday habits have never mirrored those of the Queen of England. I’m more of a book-it-on-airbnb-and-hope-for-the-best traveller than someone who regularly summers at Balmoral Castle. Nonetheless, by way of good fortune I find myself at the impeccable Huka Lodge, tucking into smoked salmon and eggs in the very room where Elizabeth II (and in years past, the Queen Mum) has enjoyed many a chef-prepared meal. It’s no wonder Her Majesty felt right at home here in The Library, where my breakfast is being served. The liberal use of tartan, forest-green wood-panelling and burgundy fabric walls hung with paintings of bygone sovereigns are enough to make anyone feel like a House of Windsor descendant. General manager Kerry Molloy informs our small party that the Queen took all her meals in this room during her four visits to the lodge, refusing to dine in any of the other 21 expertly tendered locations. It’s easy to imagine her prim figure at the dining table, snaffling portions of smoked salmon to her expectant corgis. I have always wanted to visit Huka Lodge but, knowing the calibre of the clientele, have thought it could only eventuate when my Powerball numbers finally come through. For the non-royal of us, it’s difficult to justify spending the same amount on a three-day holiday across The Ditch as a four-week sojourn in Europe. That’s easy enough to say, until you step onto the tenderly manicured lawn sweeping down to the edge of Lake Waikato. Suddenly you feel the cost is entirely justified. And, judging by Huka’s long history, so do many others. The lodge has been here since the 1920s when Irishman Alan Pye identified the bountiful fly-fishing potential of the clear-flowing river. Pye managed to acquire the seven-hectare property from an elderly local woman with whom he had cultivated an ultimately profitable (and vaguely questionable) friendship over the course of some years. There was some contention from the woman’s family about the sale, but Pye managed to keep hold of the property, creating a fly-fishing haven for well-to-do trout enthusiasts, among them the Queen Mum, respected writers, and a gaggle of film stars. According to Kerry, the clientele remains in much the same ilk, but these days it’s intermingled with the odd business tycoon, honeymooning couples, and retired lodge-hoppers. We don’t spy any mega stars during our stay, though we do enjoy speculating on which of the other categories our fellow guests fall into. 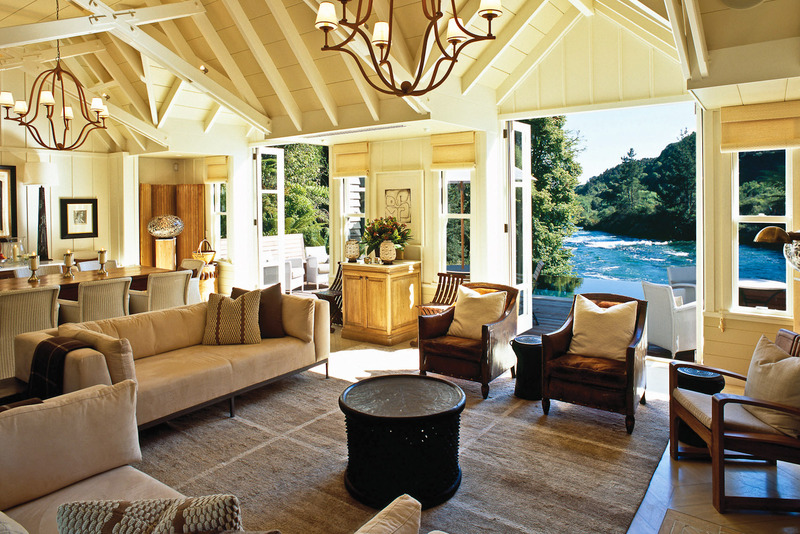 Such guests would be accustomed to the intuitive hospitality and understated luxury Huka Lodge prides itself on, but I can’t help gawking at the small details and over-exclaiming with delight every time a canapé is offered or a new room revealed. I’m the embarrassing country-bumpkin relative on their first trip to the big city, until I take a cue from other guests and assume a composed I’m-really-supposed-to-be-here aura. Once I’ve recovered from the immaculate service, which begins with a glass of Champagne on arrival and continues relentlessly thereafter, I begin to fully absorb my surroundings. The property is laid out elegantly along the banks of the Waikato with the lodge itself and the 18 guest suites bookended by two incredible dwellings, which add another seven suites. Stationed at one end is the Owner’s Cottage while at the other sits (or rather, sprawls) the Alan Pye Cottage; both are what dream homes are made of and come with a personal chef, butler, and private pool. Lucky for us, both the cottages are minus VIPs during our stay, so Kerry takes us tip-toeing through for a glimpse of what next-level luxury looks like. Having only recently acclimatised to previous-level luxury, I let fly with the exclamations anew. Marvelling at the Pye Cottage’s lounge room, resplendent in peacock blue and styled to the tiniest detail by Virginia Fisher, I find myself wondering if those who stay here are able to truly appreciate their surroundings. Executive chef Paul Froggatt might have some sort of an answer to that. He’s dropped by to show us how to create the beautiful salmon gravlax we’ll be eating for lunch. As we watch Paul use what looks like surgical tweezers to garnish a dish, he tells us that while he is available to cook privately even his sharply honed skills don’t cut it for some guests. “Once there was a Russian couple staying in the Owner’s Cottage with their two dogs, but rather than have the kitchen feed them, they brought their own private chef to cook specifically for the dogs,” he says, still laughing. Next-level luxury or next-level lunacy? While the cottages are almost painfully beautiful, they in no way diminish the deftly designed guest suites, which curve alongside the river and open out to views of rushing, turquoise currents. A muted, cream palette soothes and a luscious bed beckons, as does a deep bath, yet I am confounded by the amount of seating options provided for just two people. I could stay a week and never have cause to sit in so many chairs, especially when there are plenty of places to lounge in the grounds and up at the Lodge. If a choice in where to park your derrière is the mark of luxury, I have certainly arrived. Of course, it is much more than that. The luxury you pay for here is in the acute attention of your hosts, friendly but not informal, adept at anticipating the smallest need and happy to oblige. When one of our group asks if she might have a glass of Champagne, the question elicits a delightfully exaggerated reply from our waiter, Giacomo, “But of course, Madame. You might’ve had to drag me away, but after two days my I-belong-here routine is so down-pat I’ve convinced myself I’ll be back soon. Pulling out of the driveway, we pass a black car with tinted windows and I’m sure I glimpse the gloved hand of a certain returning guest. 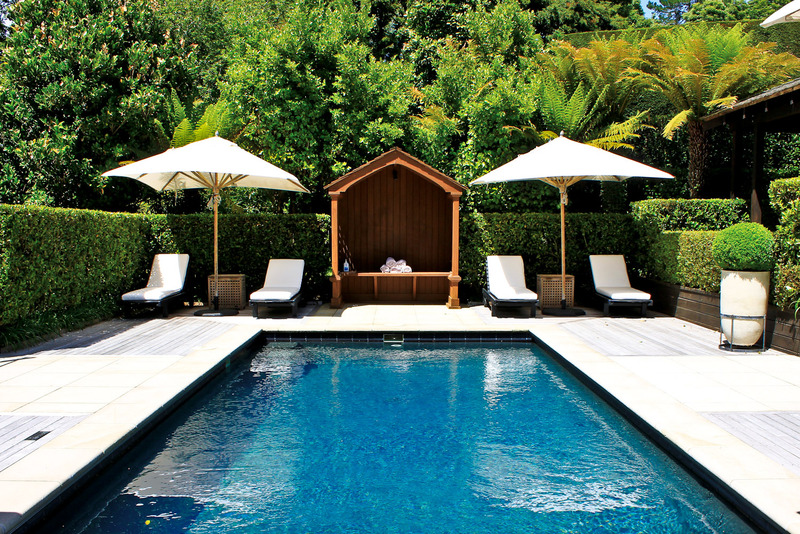 From Auckland Airport, Huka Lodge is a three-hour drive or a 30-minute flight from Auckland to Taupo. 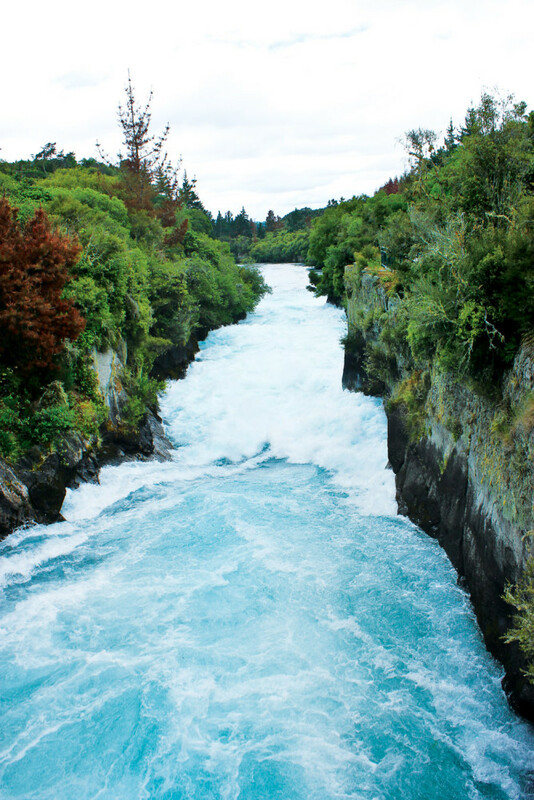 Should you choose, you can take the Huka helicopter from Auckland, Rotorua or Wellington. Rates begin at $1391 per guest, per night, for a Junior Lodge Suite in late summer (1–30 April) and include Taupo Airport transfers, breakfast, five-course dinner and pre-dinner drinks and canapés. Should you have time to spare between relaxing and eating and relaxing some more, there is much to see in the Greater Lake Taupo area. This 11-metre high wall of water is apparently the most visited – and photographed – attraction in the country. Accessible only by boat, the towering rock carvings at Mine Bay were completed in the 1970s as a gift to Taupo. This one-day trek through a World Heritage Site is punctuated by volcanoes and stunning scenery, and has been rated as one of the best in the world.